With spring on the way, By-law & Regulatory Services (BLRS) would like to remind residents that not all small wild animals found alone without an adult are orphans. It is very common for mothers to leave their babies in the nest or den while they forage for food. In the majority of cases, these mothers will return to their young. If you find a baby wild mammal on its own (skunk, raccoon, rabbit, squirrel, etc. ), please contact the Rideau Valley Wildlife Sanctuary first before calling 3-1-1. Please do not attempt to move the animal from its den/nest or to feed it. If a resident has already touched the animal, please return it to where it was found. It is a myth that the mother will reject her babies if they have been touched. 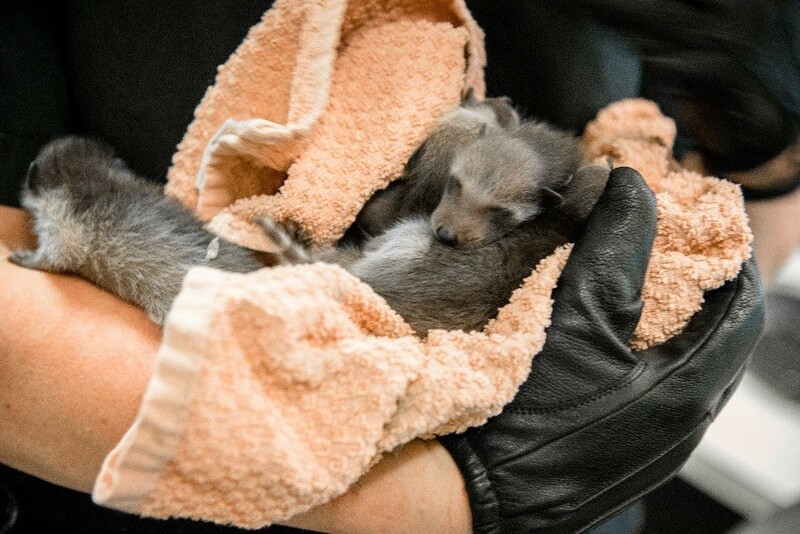 In addition, please note BLRS only responds to calls about injured or sick small wild animals. With Spring possibly upon us, I am hopeful that I will not have to cancel any of our rescheduled Town Hall meetings due to snow. As you already are aware, our Rideau-Goulbourn team has hosted a number of town hall meetings throughout the ward since the start of 2019. Unfortunately, due to the less popular Lionel Richie/Diana Ross collaboration, Endless Winter, we had to cancel a few meetings. Our inaugural drop in session last week in North Gower was very successful. Our next "Drop in to Chat" session will be on Wednesday, April 17th at the Goulbourn Town Hall (2135 Huntley Road) from 10:00am to 3:00pm. We host "Drop in the Chat" sessions on the 1st and 3rd Wednesday of every month at different locations across the ward. On these days, you are invited to stop by to chat about any concerns or issues that you have. Our following session will be on Wednesday, May 1st, tentatively scheduled for the new Morning Owl Café in Manotick. If there is a specific location you would like us to hold one of these sessions, please let us know! We are open to suggestions. The only requirement is that we need Wi-Fi. Wild parsnip is an invasive plant that is increasingly common within the City of Ottawa in areas of uncultivated land, roadside ditches, nature trails, as well as on and surrounding rural and residential properties. Wild parsnip may pose a health risk to humans. The plant sap contains chemicals that may cause skin and eye irritation and make the skin prone to burning and blistering when exposed to the sun. While the Public Works and Environmental Services Department has been proactively mapping out and controlling wild parsnip growth on public property, By-law & Regulatory Services would like to remind residents that they are responsible for removing invasive weeds on their private properties. In accordance with the Property Maintenance By-law, the owner or occupant of a residential property must clear the lands of heavy undergrowth, long grass and/or weeds so that it is consistent with the surrounding environment. Section 3(4) of the By-law also requires yards be clean and free from objects or conditions that may create a health or accident hazard. If a property owner fails to comply with an order to remove wild parsnip, the City is able to contract out the work at the expense of the property owner. In addition, the Ontario Weeds Act requires residents to destroy any noxious weeds, including wild parsnip growing on their properties. We appreciate residents' help in managing wild parsnip! The Ottawa Rural Clean Water Program (ORCWP) provides funding to landowners and non-profit organizations for projects that protect surface water and groundwater quality. Grants of up to $15,000 are available for 18 kinds of projects related to nutrient management, soil protection, water management, land stewardship, and education and innovation. The next application deadline is May 1, 2019. Farmers from rural and urban Ottawa along with landowners within rural Ottawa are eligible to apply. Approved applicants must complete a 3rd or 4th Edition Environmental Farm Plan (farm projects), or Healthy Home Guidebook (non-farm projects). Canadian Organic Certification is also accepted for some farm projects. Non-profit organizations can apply for education and innovation projects. Applications will be accepted through the LandOwner Resource Centre, which works in partnership with the Mississippi Valley, Rideau Valley, and South Nation Conservation Authorities and the City of Ottawa. Contact the LandOwner Resource Centre at 613-692-3571 or toll free at 1-800-267-3504 ext. 1136. Visit www.ottawa.ca/cleanwater to see a full list of eligible projects and to download an application form. After the winter snow, frigid temperatures and ice, you can now turn your attention to the City of Ottawa’s 2019 GLAD Cleaning the Capital campaign, taking place from April 15 to May 15. Visit ottawa.ca/clean or call 3-1-1 (TTY: 613-580-2401) to register your cleanup. Our interactive map will show you which locations have already been claimed, and our online registration form will allow you to choose your own project site and indicate the cleanup supplies that you need. Select a location, such as a park, ravine, shoreline, bus stop or pathway – any public area that requires litter pickup or graffiti removal. Thank you to everyone who has participated in the past and helped Rideau-Goulbourn win the Cleaning the Capital "Ward Award" for the greatest participation based on project participants per capita two years in a row! Join the Ever Hopeful Stringband and caller Pippa Hall for a family-friendly, alcohol-free evening of community dancing, including circles, squares and contras on Friday, April 26th, from 7:00pm to 9:30pm, at the Manotick United Church. Each dance is taught and the whole family is invited. The evening begins with simple dances, followed by dances that build on skills as the evening progresses. Admission for adults is $10, $5 for those aged 12-18 while kids under 12 are free. There is a family maximum admission of $20. For more information, call 613-692-4576 or visit http://dance.manotick.net. At Ottawa City Hall on March 6th, City Council approved the next phase of the long term light rail plans, known as LRT Stage 2. In recent weeks, there has been much press on this project and not all of it has been accurate. Seeing as I supported moving forward with Stage 2, I just wanted to use this opportunity to speak to the project and address some recent misconceptions. To begin, I think it is important to highlight the timeline for Stage 2. This is not something that has been rushed into. During my first six years on Council, we have approved various milestones leading toward extending the initial phase of LRT, which itself began during the 2006-2010 term of Council. In March 2017, Council approved the procurement process for awarding Stage 2 of LRT. At that time, we set the March 29th, 2019 date for signing the contract. Therefore, this current contract award process has been going on for the last two years. All bids had to meet certain criteria to get shortlisted and then the successful bidder was chosen from the short list. You have likely heard accusations of rushing the process. As you can see, that is not the case. Staff have just been following the Council approved schedule. In terms of the timing of approving Stage 2 before Stage 1 is open and running. Based on the timeline above, it was never suggested by staff or committed to by Council that one was contingent on the other. The reality is that Stage 1 is close to the finish line and the Rideau Transit Group is under contract to deliver the project. Failure is not an option. Handing over an incomplete project is not an option. It is essential they get this right and we have made that clear to them. In fact, we haven’t even paid them since February 2018. They are only paid when they reach certain milestones. Rideau Transit Group also has the 30-year maintenance contract for LRT so this isn’t a group that is going to wrap it up and walk away. It is in their best interest to complete the contract as approved and ensure it operates how we expect it to. Since Council agreed to a contract date of March 29, 2019, it is not just a simple task to delay a decision to wait for Stage 1 to be operational. We know the system will open. Stage 1 makes no sense without Stage 2. If we delayed beyond this month, we run the risk of contravening Council’s own procurement process. Even a six month delay would equate to an inflated construction cost of $100M. Starting over on the procurement process would result in a 1-2 year delay. Finally, media reports have suggested that LRT does not work in the winter. This is simply not true. RTG has been running trains along the entire 12km track all winter. There were certain times where weather has impacted the testing but this has been during times that would not be replicated during normal operations. Normal operations on the track will help keep snow clear from the line. Additionally, RTG is sourcing snow melting equipment for the line that could be used overnight while the trains are not running. The one benefit of the delayed open date is that it has afforded RTG more time for winter testing during the worst winter in recent memory. With the new contract, we also integrate lessons learned from the previous contract. One such change will be the Liquidated Damages aspect. In Stage 1, when RTG missed their in service deadline, they were had to pay $1M in liquidated damages. On a $2.1B project, I am not certain that $1M is a significant amount. As a result, the Stage 2 contract will feature a $10M cost assessed should the contractor not meet the handover date as set out in the contract. In the end, I believe that moving forward with Stage 2 is the right thing to do. During the 2006 election, the sentiment was clear that the public wanted something different from the North-South O-Train proposal. Larry O’Brien was elected and the current plan was born. Over the last eight years, it has been our job to deliver and we have done that so far. The longer we defer the more money this project will cost. LRT Stage 2 will bring rail closer to Manotick in Riverside South and will drastically improve the commute for those on the 283 with a transfer at Bayshore. The main issues with the 283 in recent years have all taken place along the transitway in the urban core. If anyone has any questions on this project, please do not hesitate to reach out to me. Over the last two months, our Rideau-Goulbourn team has hosted a number of town hall meetings throughout the ward. Unfortunately, as mentioned earlier, this has not been an ideal winter. As a result, we had to cancel a few meetings. While we are still working on rescheduling all of those meetings, we have rescheduled our Richmond Town Hall, which was postponed due to the Richmond Village Association Annual General Meeting. Our town hall meeting in Richmond will be held on Tuesday, April 23rd at 7:00pm at St. Philip’s Parish Hall. Tentatively, we are looking at Monday, April 15th for our Kars Town Hall. Stay tuned for dates for our town halls in Goulbourn, Ashton and Munster. We may be ready for spring but at least winter is beautiful! This is a church in Burritt's Rapids captured before our Town Hall in January. On Wednesday, March 6th, City Council will vote on the 2019 Budget. Since the beginning of February, the various boards and committees have discussed and voted on their relevant sections of the budget. That all culminates in the full Council discussion next week. What is being proposed in this year’s budget is a 3% property tax increase. The primary purpose of the higher increase, over the last eight years, is infrastructure renewal. In 2017, Council approved a ten-year plan to eliminate the infrastructure renewal spending gap, which was $70M. However, given the prominence of renewal during the most recent election, Council is now looking to close that gap within five years. The projected 3% increase gets us there. What does closing that gap mean for Rideau-Goulbourn? In recent years, we have seen annual renewal spending rise from approximately $50M annually in 2010 to $125M annually in 2017. This has led to many roads throughout the ward being resurfaced. With a projected annual spend of $195M by 2023, expect more of the same. Scheduled in 2019 are portions of Fallowfield Road, Rideau Valley Drive North, Barnsdale Road, Joy’s Road, Hope Side Road and Strachan. Mackey Road, between Malakoff Road and Viola Street will also be improved and the hard surfacing of Paden Road will be finalized. Other local infrastructure projects include preliminary design work on the renewal of the Church Street bridge in North Gower, a new sidewalk connection on Nixon Farm Drive between Cedarstone and Perth Street and the previously mentioned upgrades to the intersection of Bankfield Road and Prince of Wales Drive. From a Parks & Facilities standpoint, improvements are scheduled for the North Gower Fire Hall, Dickinson House, Richmond Arena and Chris’s Field in Manotick. We will also be upgrading Gordon & Ivy Scharf Park in the Manotick Estates this spring. On the stormwater infrastructure side of things, the City is projecting to spend nearly $13M on culvert replacements throughout the rural area. This is a significant increase over recent years and it all plays into the road renewal efforts as well. For instance, many culverts were replaced under Rideau Valley Drive North last year and that portion will be resurfaced this year. Two different budgets but all working toward the same end result. This is where your stormwater fee goes. All told, because of the way we structured the new fee, every dollar you pay for stormwater equals $12 spent on infrastructure in rural Ottawa. What that means simply is that your money is staying in rural areas and then some. While there is plenty more in the $3.6B budget, I only have so much room in this column. More information is available at Ottawa.ca/budget and you can always email me if you have any budget related questions. It is anticipated that construction will be completed by late 2020. For more information, visit: ottawa.ca. The City of Ottawa is reviewing core aspects of its Parking Management Strategy. Provide your input on the City’s paid parking program at one of three upcoming open houses and help ensure the program meets the city’s needs. For more information, visit: ottawa.ca/parkingrefresh. At my North Gower Town Hall, we had a discussion about LED lighting and a resident wanted to know how many LED street lights were installed in Rideau-Goulbourn. We have a total of 1880 streetlights in Rideau-Goulbourn. Currently, we have 193 Hydro Ottawa Retrofit lights and 215 LED lights. There are still 1472 street lights that need to be changed to LED lights. Staff anticipate all of the lights being changed in 2020. I know residents are frustrated by the amount of snow they have been forced to deal with this winter. City crews have been operating around the clock since January 19th and all resources have been deployed during snow events. The City is trying to clear and remove snow as quickly and efficiently as possible but with a record amount of snow in January, and February likely bringing a similar fate, it has been challenging. Please note that snow removal is based on a road-priority system, with high-use roads and emergency and transit routes cleared first. After the last snowflake falls, the city standard is that residential roads are cleared within 16 hours. If your street is missed, please call 311, as they are available to action your request 24/7. The City also encourages residents to avoid parking on the street where possible, to support efficient snow removal. Please remember not to push snow onto the street as this puts others using the roadway at risk, and makes it more difficult for City plows to pass. We sincerely appreciate your help and your patience as the City continues to clean up the streets. In December, Diamond Schmitt Architects and KWC Architects were selected to design the new central library, which will be an Ottawa Public Library and Library Archives Canada joint facility. Part of the design will include a robust public engagement process, both online and in person. Billed as the Inspire555 series, in a nod to the facility’s new address at 555 Albert St., the engagement process will include design workshops, pop-up events, expert lectures, online activities (local and national) and engagement with Indigenous communities - all planned for 2019. The public is invited to visit Inspire555.ca to pre-register for one of the two workshops. From 2013 to 2016, more than 3,000 people provided input into the spaces and uses for a new central library. In 2016, following the decision to explore a partnership with Library and Archives Canada, the public provided input into the selection criteria for a site for the joint facility, as well as its functional programming. This is an exciting time for our City and we encourage Rideau-Goulbourn residents to have their say! Interested in a fun, interactive session of dance, laughter & music? Join the Ever Hopeful Stringband and caller Pippa Hall for a family-friendly, alcohol-free evening of community dancing, including circles, squares and contras. Each dance is taught and the whole family is invited. The evening begins with simple dances, followed by dances that build on skills as the evening progresses. The fun takes place Friday, February 22nd, from 7:00pm to 9:30pm, at the Manotick United Church. Admission is $10, $5 for those aged 12-18 and free for anyone under the age of 12. The family max admission is $20. For more information, please call 613-692-4576 or visit http://dance.manotick.net. On Tuesday, January 29 we hosted a Commemorative Naming Ceremony for the Mike O'Neil Arena (within the Manotick Community Centre). Thank you to "Manotick Mike" for your hard work and dedication to our community. I hope everyone is staying warm, dry, cold or which ever seems appropriate with this all over the map winter. As we move into February, we also get into budget season. While Council normally approves the budget in November, these things get pushed back in an election year. As a result, the budget will be tabled on February 6th. Following the tabling, Councillor George Darouze and I will be hosting a budget consultation meeting on Tuesday, February 12th at 6:00pm at the Osgoode Community Centre. City Finance staff will also be in attendance. If you wish to make comments directly to the City regarding the budget, you can email budget@ottawa.ca. Our town hall meetings are continuing throughout February and into March. Unfortunately, due to weather, we had to postpone our Munster meeting but we will reschedule that as soon as possible. As mentioned previously, the intent of these meetings is to look at what issues are present currently in our communities, what priorities we want to focus on and any other matters that residents feel requires our attention. It is also an opportunity to discuss how best we can improve communication. Each meeting is tailored to the host community. The following meetings are still upcoming. I do want to take a moment to thank those who have come out to our town hall meetings thus far in Country Club Village, Fallowfield Village, Burritt’s Rapids and Manotick. Our North Gower Town Hall is on January 28th. We have had great discussions thus far and we do have some items to work on at the office following these successful meetings. Recently, Rural Ottawa South Support Services launched A Friendly Voice; a 24 hour friendly visiting phone line for seniors. A Friendly Voice is possible thanks to a three year Provincial Impact Grant from Ontario Trillium Foundation. Social isolation and loneliness can lead to serious health concerns, especially as we get older. Sometimes a simple conversation with another person can make a world of difference. We invite you to share the phone number with others. The phone line is primarily answered by trained volunteers. If you are interested in becoming part of A Friendly Voice, contact ROSSS at: 613-692-4697 or at info@ross.ca. As local residents are aware, the play structure at Chris Bracken Park was vandalized a couple of years ago. Unfortunately, the City is self-insured so the replacement of the structure must come from the regular budget allocation. Having said that, the City is consulting on two options for the replacement of the play equipment proposed for Chris Bracken Park located at 5545 South River Drive in Rideau-Goulbourn Ward 21. The community is invited to provide comments and preference between the two options. Please visit my website for more information. 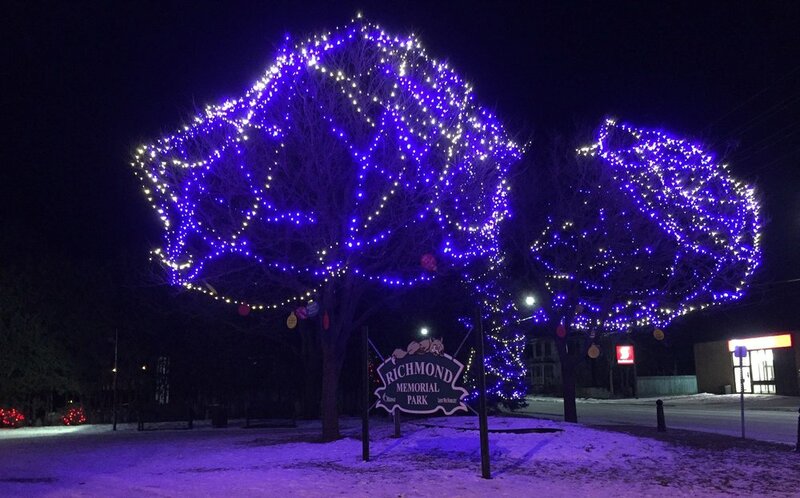 We hope you have had the chance to take in the beautiful lights in Richmond's Memorial Park! Happy New Year Rideau-Goulbourn! As we embark on a new year, I do so with new responsibilities at City Hall. In December, Council approved the roles and responsibilities for the new term of council. After serving last term as Chair of the Agriculture and Rural Affairs Committee, I had the privilege of being named the Chair of the Environment Committee. Subsequently, I brought forward a Notice of Motion to change the name of that committee to the Standing Committee on Water, Waste and Environmental Protection. The intent is to ensure that the name of the committee reflects the broad mandate of the committee and its key priorities. As for other responsibilities, I will continue to sit on Agriculture & Rural Affairs Committee, Finance & Economic Development Committee and the Rideau Valley Conservation Authority. I will also be joining the Ottawa Community Housing Board and the Planning Committee. In the coming weeks, our office will be hosting a series of town hall meetings to help kick off the term of Council. We will host these meetings in Burritt’s Rapids, Pierce’s Corners, Kars, North Gower, Stittsville, Richmond, Munster, Ashton, Manotick, Country Club Village, Fallowfield Village and in the Quinn’s Pointe community in Barrhaven. These meetings will take place between January 9th and March 5th. The intent of these meetings will be to look at what issues are present currently in our communities, what priorities we want to focus on and any other matters that residents feel requires our attention. It is also an opportunity to discuss how best we can improve communication. We have a number of new initiatives we are going to bring forward in order to better serve our residents. Included in that will be drop in meetings where residents can stop by and visit with our team. We will rotate these meetings around the ward every two weeks. I very much look forward to these meetings, as does our team. I hope you will be able to attend. On December 3rd, I had the great privilege of being sworn in as the Councillor for Rideau-Goulbourn for the third time. In the weeks since, we have gotten to work on the business of setting out the governance for this term of Council. This week, we confirmed Committee memberships and appointed Chairs of the Committees. I am excited to be appointed to the Chair of the Environment Committee, to sit on the Planning Committee and Ottawa Community Housing Corporation and to continue my work on the Agriculture and Rural Affairs Committee, Built Heritage Sub-Committee, Committee of Revision and the Rideau Valley Conservation Authority. This week we also debated the matter of retail cannabis sales at a special Council meeting held on Thursday, December 13th. It was decided that Ottawa will permit retail cannabis stores beginning April 1, 2019. Permitting retail cannabis stores will help reduce the black market and provide consumers access to safer products in a highly regulated environment. The City will spend less resources shutting down illegal sellers, and receive additional funding from the Ontario Cannabis Legalization Implementation Fund to offset the costs related to the legalization of recreational cannabis. Cannabis retailers will also create economic and employment opportunities in the city, including spinoff benefits for other sectors. The direction followed Council’s consideration of the Report on Ontario Cannabis Legislation, Cannabis Retail Stores and Response to Council Direction of August 29, 2018 and feedback from public delegations. Council heard presentations from nine members of the public. This is in addition to 23,000 responses to an online survey conducted earlier this fall. The responses to the online survey and a random sample telephone survey generally supported permitted retail cannabis stores in Ottawa. Public input indicates that residents want stores with appropriate controls and protections to minimize the impacts on the community. Staff will report on the impact of the legalization of recreational cannabis on City services in late 2019. Furthermore, this report focused on cannabis retail stores, however, as new issues emerge, the City will consult with residents and provide additional reports and recommendations to Council as required. Following the three Council meetings in early December, the Christmas break will be upon us. In the new year, the new Committees will begin their work with focus on developing the term of Council priorities and preparing the 2019 Budget. In my last e-newsletter, I announced that our office will be hosting a series of town hall meetings to help kick off the term of Council. We will host these meetings in Burritt’s Rapids, Pierce’s Corners, Kars, North Gower, Stittsville, Richmond, Munster, Ashton, Manotick, Country Club Village, Fallowfield Village and in the Quinn’s Pointe community in Barrhaven. These meetings will take place between January 9th and March 5th. The Mayor’s City Builder Award is a civic honour that recognizes an individual, group or organization that have - through their outstanding volunteerism or exemplary action - demonstrated an extraordinary commitment to making our city a better place today and for the future. Past recipients have been honoured for their life-long service, outstanding acts of kindness, inspiring charitable work, community building and other exemplary achievements. This award is presented at the beginning of each Ottawa City Council meeting. As a member of Council, I would like to invite you to nominate individuals, groups or organizations that have had a positive impact in our ward and in our community. Our aim is to ensure a diverse representation of outstanding residents from all corners of our city. Please contact my office for nomination forms. Regular business hours will resume on Thursday, January 10th. The North Gower CSC is located at 2155 Roger Stevens Drive and is open on Thursdays from 8:30am to 4:30pm. ARAC Meets on Monday, Road Work, Santa Claus Parades and More! Here's a cool video residents may enjoy of the deck and girder removal of the McBean Street Bridge taken in August, during the full bridge closure. Click image to watch. Work needs to be completed under temperatures that allow for proper compaction of materials and/or paving work. The forecasted weather will not allow us to achieve the desire product quality for our roads. The contract is not cancelled and funding remains in place. The Contractor also remains engaged to complete the work. Work will resume in the spring of 2019, which is typically once asphalt plants re-open and when half-load restrictions are lifted. In the meantime, the contractor will be back to remove the construction signage and cones. I will post an update on these projects in the spring. The City of Ottawa is currently recruiting for citizen members to serve on various Committees and Boards. These include membership on the Rideau Valley Conservation Authority, Built Heritage Sub-Committee, Transit Commission and many more. The City benefits greatly from the expertise and knowledge of its citizens in this capacity and in return, those who join gain insight and knowledge of how the City works. To be eligible, you must be a resident of the City of Ottawa and must be 18 years of age or older in order to be eligible for appointment. Participants may be eligible for re-imbursement of some out-of-pocket expenses. Employees of the City of Ottawa are not eligible for positions as citizen members on committees, conservation authorities, boards, sub-committee or commission. For more information, please visit ottawa.ca/committees or contact Carole Legault at 613-580-2424, ext. 28934 or by email at committees@ottawa.ca. Ottawa Public Health recommends that residents on well water test their water supply three times a year (or after major plumbing work). You can test your water for free by dropping off samples at many locations across the City (visit www.ottawapublichealth.ca for locations). The newest location for pickup of bottles or dropping off samples is at The General Store Marketplace in Ashton during regular business hours, which you can find on their Facebook page: https://www.facebook.com/thegeneralstoremarketplace/. Residents can pick up bottles any day during regular business hours and can drop off samples every Thursday (the courier will pick up samples every Friday at 8 am). Canadian Guide Dogs for the Blind will host its 9th annual Holiday Bake Sale on Saturday, December 1 from 9:00am until Noon. Stop by to purchase some homemade baked treats and other unique items. Indulge on the day or stock up on baked goods to serve guests over the holidays. Other items include Christmas cards, TY Beanie Babies, doggy bone Christmas wreaths, dog toys, and exclusive Canadian Guide Dogs for the Blind merchandise. 100% of the sales proceeds support Canadian Guide Dogs for the Blind. Canadian Guide Dogs for the Blind is located at 4120 Rideau Valley Drive North. For further information about the Holiday Bake Sale, please contact (613) 692-7777 or email events@guidedogs.ca. Please note there will be no outside vendors at the event. Canadian Guide Dogs for the Blind was established as a registered charity in 1984. Canadian Guide Dogs for the Blind has provided more than 850 professionally trained guide dogs to Canadians who are visually impaired from coast to coast. Canadian Guide Dogs for the Blind also has an Assistance Dogs Division, which trains assistance dogs for individuals in the Ottawa area with mobility-related disabilities. The West Ottawa Ladies chorus is delighted to present its annual Christmas concert, this year entitled Sing with Festive Cheer! It will take place on Friday evening, December 7th at 7:00pm and again on Saturday afternoon, December 8th at 2:30pm. The venue is St. Paul's Anglican Church in Kanata. Welcome back to our bi-weekly Rideau-Goulbourn column following the 60-day election blackout period. Over the coming weeks and months, we will want to connect with residents across the ward. As we did in January 2015, we will organize a series of town hall meetings in various communities to discuss priorities for the upcoming term of Council. We are also going to look at ways of expanding our communication efforts. In eight years, we have always strived to improve and keep finding ways to serve you better. That will not change. And now for something completely different…. Through a randomized telephone survey being conducted by Ekos Research Associates on behalf of the City. As you may know, currently Ontarians aged 19 years or older may purchase cannabis for recreational use online only via the Ontario Cannabis Store. However, the Province of Ontario has passed the Cannabis Licensing Act, 2018 (not yet in force) that establishes a Provincial licensing regime for private cannabis retail stores beginning on April 1, 2019, in municipalities that will allow them. These cannabis stores will be licensed and administered by the Alcohol and Gaming Commission of Ontario in accordance with rules and regulations set out by the Province. The Province is allowing municipal councils to decide, by January 22, 2019, whether to allow private cannabis retail stores within their borders. In accordance with the Province’s new cannabis legislation, municipal councils will have a one-time opportunity to “opt-out” of private cannabis retail stores, and will be unable to opt-out at a later date. However, municipalities that have opted-out by January 22nd will be able to reverse their decision and allow cannabis retail stores in their municipalities at a later date. It is expected that the newly elected City Council in Ottawa will consider the issue of cannabis retail stores later this year, at a date to be determined. City staff will present public input collected through these surveys to City Council to assist Council in its consideration of this issue. For now, Ontarians aged 19 or older can purchase cannabis for recreational purposes at the Ontario Cannabis Store only. Before April 1, 2019, cannabis store fronts/dispensaries remain illegal. Should you require further information about cannabis, please visit Ottawa.ca and OttawaPublicHealth.ca. The City of Ottawa has lost thousands of ash trees due to the Emerald Ash Borer (EAB). This invasive beetle, native to Asia was first detected in North America in 2002. Since its arrival, it has killed tens of millions of ash trees and continues to spread, causing considerable economic and ecological damage. As a result, many private property owners are left with dead or dying ash trees. To help address this, South Nation Conservation (SNC) has partnered with the City of Ottawa, to pilot a cost-sharing ‘Ash Tree Replacement Program’. The program is available to property owners with affected ash tree(s) located in the City. Eligible applicants agree to use a forestry professional to confirm and remove EAB infected ash trees and to replace all removed trees with suitable native trees. Managed similar to the Ottawa Rural Clean Water Program with the partner Conservation Authorities, the Ash Tree Replacement Program will also be managed and administered by SNC. Funding support has been provided by the City of Ottawa. Interested applicants are encouraged to visit our program website at nation.on.ca/eab or to contact SNC for eligibility details. This is the last time I am able to communicate through this medium until after the October 22nd municipal election. City Council adopted an Election-Related Resources Policy which includes a “blackout period” in which corporate resources and Member of Council’s office budgets are not to be used to sponsor any advertisements, flyers, newsletters or householders. The 60-day “blackout period” is in effect from Thursday, August 23, 2018, up to and including Monday, October 22, 2018 (Voting Day). During the “blackout period”, advertising for City events or services cannot, in broad terms, include the name of any Member of Council who is also a candidate. For any pressing City matter, we will make sure that those items are provided to the Village Voice for Manotick issues and the Richmond Hub for Richmond issues. For other areas of the ward, there is a protocol for how matters can be communicated to ensure proper notification still occurs in the meantime. Please be assured that the only thing impacted here is how we communicate to the public. My office will still be attentive to anything that comes our way. Should you have any questions or concerns on anything, email my office [rideaugoulbourn@ottawa.ca] or give my team a call [(613) 580-2491] and we will assist you. For election related questions, please reference the City's website: Ottawa.ca. Munster resident Maggie Tunbridge captured the Shillington/Old Methodist Cemetery and the Old Shillington property on Copeland Road back in October 2010. Thank you to Maggie for sharing this photo! In recent weeks, I have used this column to touch on some construction projects throughout Rideau-Goulbourn. This week, I would like to notify residents about two projects not in Rideau-Goulbourn but that will certainly affect the commute of some of our residents. In Riverside South, Urbandale will be extending the trunk watermain, sanitary and storm sewer on River Road south of the Summerhill intersection. This is a substantial construction project to convert the road to a full urban cross section with three new deep sewer crossings. The depth of excavation means that the contractor cannot provide a safe active lane of traffic through the construction zone. As a result, a full closure of River Road will be required. The intent would be to complete the works in July and August 2018 taking advantage of the reduced traffic during the summer holiday period. We acknowledge that the closure of River Road will be disruptive, however due to depth and size of the trunk sewers we cannot safely install the infrastructure without full closure of River Road. Residents of Manotick will have to detour using Rideau Road and Spratt Road to travel north. For Goulbourn residents, you have likely noticed the closure of Eagleson Road, between Hope Side Road and Fallowfield. This section has been closed for a culvert replacement project. The road is closed for safety reasons. The culvert is located on Eagelson just north of Fallowfield. Last summer, two steel plates were installed on top of the culver to maintain the integrity of the road. Unfortunately, the culvert deteriorated quicker than anticipated and will be replaced immediately. The detour is via Hope Side Road to Old Richmond to Fallowfield. The closure is expected to last two weeks. The City has requested the contractor to expedite the construction and open the road as soon as they can. While the work north of Fallowfield Road is carried out, the City will also be replacing a culvert between Akins Road and Fallowfield Road under Eagleson as well. These coordinated works will help mitigate future traffic disruptions. The City of Ottawa has received a Site Plan application to accommodate the development of a four-island gas bar, 1 storey convenience store and a drive-through facility. For long time residents of the area, you will know this property as the former site of Driscoll’s Pizza. For those newer residents, it is located just west of Dorack Drive, immediately to the west Tubman’s Funeral Home. It was most recently an art studio. The existing joint access with the subject property from Roger Stevens Drive would remain. The Site Plan application has been filed to accommodate the redevelopment of the subject property. The proposal includes the demolition of the existing buildings and the development of a new one-storey convenience store, four-island gas bar, and associated drive-through facility. The site will be serviced by private well and septic system and will have a parking lot, which will accommodate 20 parking spaces. This proposal is good news for those worried about a similar application coming forward for the southeast corner of Roger Stevens Drive and Rideau Valley Drive South. Through hydrogeological studies, it was determined that corner was not suitable for a service station. Also contained in this plan are a 3.75 hectare community park co-located with a 2.48 hectares school block, a 0.8 hectare parkette and 19 public streets. Of some importance to note, the lands adjacent to properties along Queen Charlotte and Ottawa Street, which were originally proposed to abut a stormwater management pond, are no longer part of this submission. Mattamy did not acquire that property. There are no plans for that parcel of land at this time. As many of you may recall, Mattamy Homes owns the southern portion of the Western Development Lands. Caivan Communities are currently developing the lands to the north of this proposal. The southern edge of the subject lands abuts the Jock River flood plain. These plans can be viewed at Ottawa.ca/devapps. Comments are being accepted until August 16th, 2018 and can be directed to Cheryl.McWilliams@ottawa.ca. This statement is to advise that the low water status in the Rideau River watershed is now at Moderate severity. Rainfall in the last 90 days, measured at climate stations in and around the watershed, is about 60% of the normal amount for the time of year which is the threshold for Moderate Severity Low Water. Rain presently forecast for much of next week will be welcome but is not expected to have a significant impact. Longer range forecasts indicate temperatures above normal and precipitation below normal through the rest of the summer and into the fall. Although daytime highs greater than 30 degrees appear to be passing, it will still be warm enough for evaporation to continue to reduce water levels on all lakes and streams. Levels and streamflows are below normal for the time of year but are still above critical thresholds. Flows in smaller streams will be raised briefly if the short range weather forecasts prove to be accurate. Rideau Canal reservoir lakes are at levels typical of later into September. However, there have been no reports of insufficient draft on the Rideau Canal system relayed to the Conservation Authority. Conditions are expected to decline generally. Conservation Authority staff continue to monitor conditions and communicate with water managers throughout the watershed. Updates to this message will be issued as conditions warrant. Water conservation is recommended for everyone within the Rideau River watershed including residents on private wells inside the City of Ottawa boundary. Those who have permits for taking water from surface or groundwater sources are encouraged to reduce their actual taking as much as possible. Residents on private well systems are also urged to use water conservatively. Using rain barrels to capture any rain to water lawns and gardens. Avoid using pressure washers to clean houses, driveways, decks and fences. All these actions contribute to the conservation of our water resources. It is a busy year for Rideau-Goulbourn parks. Blue Rock Park in Kars is currently undergoing renewal while staff work toward the renewal of the play equipment at Richmond Lions Park, in addition to the planned outdoor rink to be located there this year. Planning also continues on Sarah McCarthy Park in Richmond and Ivy & Gordon Scharf Park in Manotick. All the while on Fairmile Road, we inch closer and closer to being able to add play equipment after the acquisition of some land and the progress on a road closure. With all of that going on, the City, working with Councillor Michael Qaqish’s office and our Rideau-Goulbourn team, have just embarked on an update to the Beryl Gaffney Park concept plan culminating in some new investments in the park. We had our public open house last week with over 60 residents in attendance. In the coming weeks, we will formalize the method for feedback. Please stay tuned to this column and that of the Manotick Village & Community Association for more information. The most significant infrastructure project to hit Richmond in some time has begun with the reconstruction of the McBean Street Bridge. In recent weeks, preparatory works began on site. These included some tree removal and the relocation of Bell lines. Aecon Construction has been contracted to carry out the bridge replacement project. The Commence Work Order was issued on June 20th and their completion date is scheduled for December 19th, 2019. While the project itself will take up to 18 months, the impact on heavy vehicles and transit should only be approximately six months. As soon as one side of the bridge is complete and open, that newly constructed side will not have the weight restrictions any longer. For all other traffic, including cyclists and pedestrians, one lane of traffic will be available, except for a couple of occasions where a full closure may be necessary. The first full closure could occur within the next couple of months but the contractor is aware of significant Richmond events, such as the Fair and the Santa Claus parade and will ensure those are not impacted negatively. If you happen to be a transit rider and frequently use the 283, there is a detour in place for the duration of the first phase of construction. The detour has been designed in a way to minimize the delay on the fewest number of riders. Simply put, riders from Munster and those who live on the South Carleton side of the Jock River will experience a longer commute. I thank those riders for their patience as we undertake this important project. In recent weeks, some of you may have heard my name being thrown around regarding Mattamy’s proposal to alter the Stonebridge Golf Course and build 158 additional units on the golf course property. The reason why I am mentioned is quite interesting as the development application actually falls entirely within Rideau-Goulbourn’s ward boundary. Similarly, there is a street in Stonebridge called Stromness Private, which also falls within Rideau-Goulbourn. When the current boundaries were created in 2005, holes five through eight were considered to be outside the urban boundary. The urban boundary set the ward boundary lines. With the urban boundary changes that were approved in and around 2010, certain lands in Stittsville and Barrhaven that I now represent became developable, including this portion of Stonebridge. The intention is to correct these lines in 2019 with a ward boundary review. In the meantime, I will be working with Councillors Jan Harder and Michael Qaqish on the issues that impact our Barrhaven consituents. Pertaining to Rideau-Goulbourn, the zoning amendment for 2683 Mackey Road is simply a surplus farm severance application where the retained lands are zoned to prohibit residential uses as the creation of a new building lot in the agricultural zone is not permitted. The report on the Richmond West Municipal Well System is to recognize the new well system within the Mississippi-Rideau Source Protection Plan. For every communal well system in rural Ottawa, there is an identified area that is to be protected to ensure clean drinking water. Property owners within the area of potential risk are notified and informed how they can reduce the risk to the system. The commemorative naming application for Mike O’Neil Arena pertains to the Manotick Community Centre. Recently, an application was received to name the arena inside the Community Centre as the Mike O’Neil Arena to recognize his many contributions to the community of Manotick, specifically in the hockey community. Most recently, Mr. O’Neil spearheaded the initiative to expand the arena, working alongside various community organizations. There are many ways to celebrate Canada Day but in Rideau-Goulbourn, we have two great community events to help celebrate our 151st birthday. The two events are Canada Day in the Gower and the Munster Canada Day Extravaganza. The North Gower event features activities all day long at the Alfred Taylor Recreation Centre while in Munster, festivities will occur at the Community Centre. The Order of Ottawa recognizes the professional achievements and outstanding service of exceptional Ottawa residents. This prestigious civic award honours up to 15 of Ottawa’s most deserving individuals each year. Any resident of Ottawa who has made a significant contribution in a professional capacity that has been of benefit to our community may be nominated. Nominations for the Order of Ottawa or the Brian Kilrea Award for Excellence in Coaching may be completed online or by filling out a nomination form in pamphlets that are available at the City Hall Information Desk, and at your local community centre, public library, or at any client service centre. The deadline for nominations is Friday, September 7 at 11:59 p.m. EST. Nominations will be considered every year for five consecutive years from the date of submission. More information on both awards can be found online at ottawa.ca/orderofottawa. Nominations by immediate family members, self-nominations, and posthumous nominations will not be accepted. Elected municipal, provincial and federal officials are not eligible to be considered for this award while they are in office. It was great having a little piece of home downtown at City Hall on June 1st at the Mayor's Annual Rural Expo. Thanks to all those who participated! Over the next few weeks and months, several construction projects may affect your daily commute. Road resurfacing projects will be undertaken on Rideau Valley Drive South, Potter Drive, and Barnsdale Road, between Twin Elm Road and Moodie Drive. Microsurfacing projects will also be undertaken along certain parts of Fourth Line Road, Eagleson Road, Dwyer Hill Road and Old Richmond Road. These were approved in early 2018 with the allocation of an additional $10M for road projects. Rideau-Goulbourn is the recipient of $2M of those funds. Finally, Gallagher Road, between Mackey and Malakoff, will receive its final treatment as part of the rural road upgrade that commenced last summer. The replacement of the McBean Street bridge will commence shortly. The project has been awarded to Aecon. This massive project is expected to be carried out over the next 18 months. There will be impacts to traffic, specifically for heavy vehicles and buses. I will be providing a more detailed update on this project in the Richmond Hub shortly. The sewer works along Martin Street are ongoing. As a part of this project, a Road Close Authorization has been granted for Fortune Street from Martin Street to Royal York Street. The road is scheduled to be closed from Friday, June 22nd to Wednesday, August 15th. On behalf of Richmond Village Ltd. (Caivan), Ottawa Greenbelt Construction Co. Ltd. will be undertaking the replacement of a sanitary trunk sewer. Notification signs will be posted. There will be a signed detour. Local and emergency vehicle access will be maintained. If you have any questions about these projects, please let me know. Need new garbage, recycling bins? It just got easier! As of June 4th, 2018, residents of Ottawa who require a new blue, black, or green bin will no longer need to request a Canadian Tire coupon to receive new bins. A new delivery service is being implemented that will simplify the process for residents to obtain recycling containers. Recycling containers will be delivered directly to the resident’s home. Making an online request for new bins. Once a request has been received, the bins will be delivered to the resident’s home within five (5) business days. Contacting 311 to make a request for new bins. Once a request has been received, the bins will be delivered to the resident’s home within five (5) business days. Visiting a City Client Service Centre (CSC) and requesting the bins. The CSC will create a service request to have the bin delivered to the resident’s home within five (5) business days. The new delivery system will address the issue where residents had concerns about transporting the bins due to size. The service will also address and meet the requirements for the Accessibility for Ontarians with Disabilities Act. Residents who previously received coupons for the replacement of their bins must redeem their coupons on or before June 30th. After June 30th, the coupons will no longer be valid. Following the approval of the Traffic and Parking By-law Update 2017 report by Council on September 13th, 2017, the Traffic and Parking By-law (No. 2017-301), and corresponding set fines approved by the Ontario Court of Justice are now in effect as of June 1st, 2018. As part of the approved report, a significant change in the new by-law relates to the long-standing 3-Hour Parking Rule, as it applies to weekends and statutory holidays. Under the previous by-law, on weekends and statutory holidays, motorists would only be allowed to park for three consecutive hours (between 7:00am and 7:00pm), on streets where there are no parking limit signs. As of June 1st, 2018, on weekends and statutory holidays, motorists are now able to park for up to six consecutive hours (between 7:00am and 7:00pm) on streets where there are no parking limit signs. On June 20th, the Kars on the Rideau Public School Parent Council invites parents to an evening of information on supporting their children during the middle and tween years to maintain healthy lifestyles. This session is aimed at parents of children in grade 4 to 8. This session is presented in collaboration with the City of Ottawa’s Public Health unit and Rideauwood Addiction and Family Services. Speakers will be present from both agencies discussing a number of issues, including the use of cannabis, vaping and opioids. This session will take place at the school between 7:00 pm and 9:00 pm. Participants are encouraged to register as space is limited. You can do so at the following link: www.eventbrite.com/e/an-evening-of-information-tickets-46664058455. The first barn quilt was installed on the dining hall in Richmond! This barn quilt is to celebrate the loyalist settlers of Richmond... red and grey for the uniforms, yellow and green for the fields of corn and blue for the Mighty Jock River. Thanks to Peter and Alison Tranter for the picture! After a few months of busy meetings with the Cranberry Creek, Hard Rock Casino Ottawa, Site Alteration By-Law and the Carlsbad Springs waste recovery facility, this is a fairly light agenda in comparison. The report on the floodplain mapping recommends approving updates to the zoning by-law to reflect new floodplain mapping conducted by the Conservation Authorities. Lands affected are within the watersheds of Constance Creek, the Ottawa River near Constance Bay, Huntley Creek, Feedmill Creek and the Rideau River between the Ottawa River and Burritt’s Rapids. The temporary zoning amendment for 4041 Moodie Drive will allow Ottawa Fire Services to continue using the City-owned site as a training facility. As usual, we meet at Ben Franklin Place in the Nepean Council Chambers and our meetings begin at 10:00am. The Ottawa Rural Clean Water Program (ORCWP) provides funding to landowners and non-profit organizations for projects that protect surface water and groundwater quality. Grants of up to $15,000 are available for 18 kinds of projects related to nutrient management, soil protection, water management, land stewardship, and education and innovation. Applications will be accepted through the Land Owner Resource Centre, which works in partnership with the Mississippi Valley, Rideau Valley, and South Nation Conservation Authorities and the City of Ottawa. Contact the Land Owner Resource Centre at 613-692-3571 or toll free at 1-800-267-3504 ext. 1136. Visit www.ottawa.ca/cleanwater to see a full list of eligible projects and to download an application form. Amidst Dickinson Days weekend, June 2nd is the date of the 2018 Big Give. Every year, churches across the country use this day to bless their neighbourhoods through a unified day of giving. It is not a garage sale. They are not raising money. Everything is free. It is their way of helping those in need. This year, Manotick’s newest church, the Manotick Community Church, will be taking part for the third time. This Saturday, drop by 5492 South River Drive, former Manotick Medical Centre, between 8:00am and 1:00pm. They will also have free muffins and coffee in the morning and free hot dogs at lunch. Most importantly, they will have a parking lot FULL of free stuff to choose from. The Cornerstone Wesleyan Church in North Gower is also participating at their home, 6556 Prince of Wales Drive. This annual tradition and significant fundraiser takes place this year on Friday, June 1st between 10:00am and 2:00pm at Ottawa City Hall. 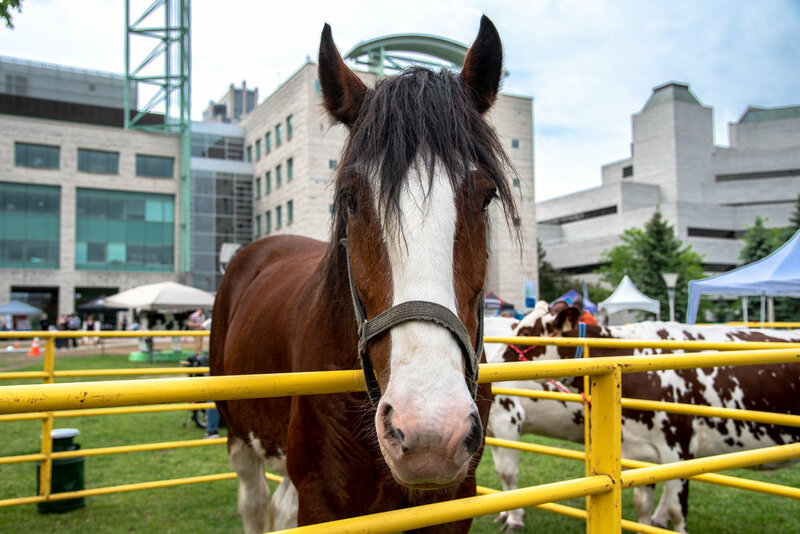 The event is an opportunity for urban residents to get a taste of rural Ottawa and while they are there, partake in a fundraiser BBQ cooked by THE WORKS. The cost of the BBQ lunch is $10 and includes a burger, side and drink (debit, credit or cash will be accepted). Music will be provided by New Country 94. As always, the event will also feature the celebrity cow milking competition. The rural tradeshow, kicking off at 10:00am, features farmers, businesses and organizations promoting unique goods and services. Booths will be located at Marion Dewar Plaza and inside City Hall at Jean Pigott Place. Last year the event raised $106,000 in support of Food Aid; a program run by the Ottawa Food Bank to purchase and process beef from local farmers. Beef adds nutritious protein to the diets of families requiring this support while boosting the domestic market for cattle. Doors Open Ottawa, a free annual architectural event that celebrates our community’s built heritage, is back! On June 2nd and 3rd, you can explore over 140 unique buildings that have shaped the Ottawa landscape, such as the Supreme Court of Canada, Hydro Ottawa’s new Hydroelectric facility at Chaudière Falls, the Global Centre for Pluralism, and the Bank of Canada. Local participants include Dickinson House, Watson’s Mill, Rideau Archives, Rideau Valley Wildlife Sanctuary and the Goulbourn Museum. For disability-related accommodation required to participate fully in this event, please contact the City at doorsopen@ottawa.ca or call 3-1-1. For more information on this event, please visit Ottawa.ca/doorsopen. The North Gower Farmers’ Market is now open! You can visit the market at 2397 Roger Stevens Drive between 8:30am and 1:00pm on Saturdays until October 6th. For more details, please visit www.northgowerfarmersmarket.wordpress.com. There has been a lot of discussion surrounding municipal drains lately due to the proposed maintenance and upgrades to the Cranberry Creek Municipal Drain. With municipal drains being discussed, often the subject of the stormwater fee comes up as well. I would just like to take a moment and explain why the two are not entirely related. “A municipal drain is a system to move water. It is created pursuant to a bylaw passed by the local municipality. The municipality is responsible for the construction of the drainage system and future maintenance and repair. Costs may be recovered from the property owners in the watershed of the drain. Municipal drains are identified by municipal bylaw that adopts an engineer's report. These reports contain plans, profiles and specifications defining the location, size and depth of the drain, and how costs are shared among property owners. The Cranberry Creek Municipal Drain was established in 1895. The Drainage Act sets out the process for establishing a municipal drain. It is done so through a petition by those seeking improved drainage. If you are a regular reader of this column, you will have read about the Engineer’s Report that pertains to this specific drain calling for a replacement of the former pump and dyke system. Since a municipal drain is a private system established by property owners, the costs of the work on Cranberry Creek gets attributed back to the property owners within the watershed of the drain. It is important to note that, since the Cranberry Creek is already an established drain, a petition is not required for maintenance, as per Section 78 of the Act. Some have asked whether property owners who pay for a municipal drain also pay the stormwater fee. They do. Essentially, it would be no different if you lived in a private community on private roads. Your property taxes would still pay for roads. The stormwater fee pays for roadside ditches, cross culverts and other City-owned drainage infrastructure. Whether a municipal drain was present or not, the need for stormwater infrastructure still exists. A municipal drain is not City-owned. It is established at the request of property owners, not the municipality, therefore the costs are not assessed to the taxpayer at large. Some have referred to this as “double dipping.” It is not. The municipality provides a drainage network required for draining roads. Municipal drains are drainage ditches that exist above and beyond roadside ditches. While there are many throughout the City, they are not everywhere and, thus, not every resident pays into one. In some cases, though, municipal drains overlap with roadside ditches. That is not the norm, however. If you happen to have any questions relating to municipal drains, please do not hesitate to contact me. On the City’s geoOttawa mapping tool, you can also locate all municipal drains within the City of Ottawa boundaries. It could be helpful for residents wishing to know if a municipal drain exists in their area. Now that the nice weather is here, make sure you obtain a burning permit before you start to burn. Beginning this year, Open Air Fire Permits can be obtained online. Simply go to https://myservice.ottawa.ca/profile/account/login. If you already have a myservice account, log in. If you do not have an account, follow the easy steps to create one. Online payment options include: MasterCard, Visa, American Express, Interac Online, MasterCard Debit and Visa Debit. For the more traditionally minded, fire permits may still be acquired at any City of Ottawa Client Service Centre. June 2nd is the date of the 2018 Big Give. Every year, churches across the country use this day to bless their neighbourhoods through a unified day of giving. It is not a garage sale. They are not raising money. Everything is free. It is their way of helping those in need. This year, Manotick’s newest church, the Manotick Community Church, will be taking part for the third time. On the Saturday of Dickinson Days, drop by 5492 South River Drive, former Manotick Medical Centre, between 8:00am and 1:00pm. They will also have free muffins and coffee in the morning and free hot dogs at lunch. Most importantly, they will have a parking lot FULL of free stuff to choose from. The MCC is also looking for donations and volunteers for this big day. Anything from books to appliances will be accepted. Please contact rosemary@celtic.ca should you wish to help. The main item on this agenda is the zoning amendment for 4837 Albion Road. This application is several years in the making as it pertains to the Rideau Carleton Raceway site paving the way for the addition of a nine-storey hotel on the site of the soon to be Hard Rock Casino Ottawa. The application also permits an increase to 55 gaming tables from the currently allowed 35. The overall development project will see an investment of over $300M into the rural south site including a live theatre. The storefront industry amendment is something that I spoke of in this column previously. The intent is to support small-scale businesses that would include micro-brewers/distillers, food processors and craft makers. These permissions would be added to commercial and mixed-use zones. The Omnibus amendment features some minor changes to properties across the City. In Rideau-Goulbourn, this report will see a minor zoning change to 5970 Dwyer Hill Road and add “medical facility” as a permitted use in the VM2 zone in the core of Manotick. The Site Alteration By-Law item is a revisiting of the item approved by ARAC last month. Staff were directed to make some changes to how Section 10 of the by-law is applied in the rural area and to clarify the agricultural exemption. For more information on this agenda, please visit Ottawa.ca or subscribe to our e-Newsletter. The Rideau Valley Wildlife Sanctuary is now accepting applications for summer student positions. Please note that these jobs are still pending approval, expected in mid to late April, under the Canada Summer Jobs program. To apply, send your resume; covering letter, including your availability and eligibility under the Canada Summer Jobs program; and two references by email to development@rideauwildlife.org. Only complete applications will be accepted. Only those selected for an interview will be contacted. Presto card services will be rolling out to retailers across Ottawa. Transit customers will be able to purchase monthly passes, load funds, check their balance, and set age-based discounts at 66 Shoppers Drug Mart, Loblaws and Real Canadian Superstore locations in Ottawa. The new retail locations are currently being rolled out in a phased approach, with all stores expected to have Presto services available by the end of May. For an up-to-date listing of locations, visit octranspo.com or prestocard.ca. The addition of 66 new outlets will make it easier for transit riders to make Presto transactions. They include 51 Shoppers Drug Mart, 12 Loblaws and three Real Canadian Superstore locations. When customers put funds on their Presto card at one of the retailer locations, the balance will be available immediately. First-time Community Pass and EquiPass customers must have their discounts set at one of the four OC Transpo Customer Service Centres. Once set, these customers can then load a monthly pass or funds at any of the locations across Ottawa or online. Transit customers will continue to be able to use the four OC Transpo Customer Service Centres, three ServiceOttawa Client Service Centres, and ticket machines at Carling, Carleton, Mooney’s Bay, and Greenboro stations to purchase their Presto products. Presto cardholders are also able to load funds and check their balance online at prestocard.ca. Presto cards purchased at Shoppers, Loblaws and Superstore locations will have a new black design. However, whether cards are black or green, they will still function exactly the same way. For more information, please visit octranspo.com or prestocard.ca. The Premier's Award for Agri-Food Innovation Excellence program supports and recognizes the dedication, hard work and innovation of local agri-food businesses and individuals who are adding value to existing products, helping create jobs and contributing to economic growth. Program applications are reviewed by two independent panels consisting of agri-food industry representatives from across the province. Review the application checklist to ensure you have completed all steps correctly. For more information about the awards and the application process, please review the program guidebook. If you have any questions or would like a hard copy of the application form, please contact the Agricultural Information Contact Centre at 1-877-424-1300 or ag.info.omafra@ontario.ca. Please note that the Manotick Miler is on again this weekend. There will be road closures throughout Sunday morning. These closures will affect Manotick Main Street, Century Road, First Line Road. Please plan your route accordingly should you be travelling anywhere on Sunday morning. Similar to last month, the publish date of the Messenger during the first week of May does not align with the release of the agenda for our May 3rd meeting of the Agriculture & Rural Affairs Committee. Although not completely set, the agenda will include the revisions to the Site Alteration By-Law that will improve clarity and remove ambiguity surrounding the agricultural exemption and some of the definitions. The agenda is also expected to include the Zoning By-Law Amendment for the Rideau Carleton Raceway property, which is a major step in the Hard Rock Casino development. Please be sure to sign up for our e-Newsletter, if you have not already, as the complete agenda will be sent out next week. 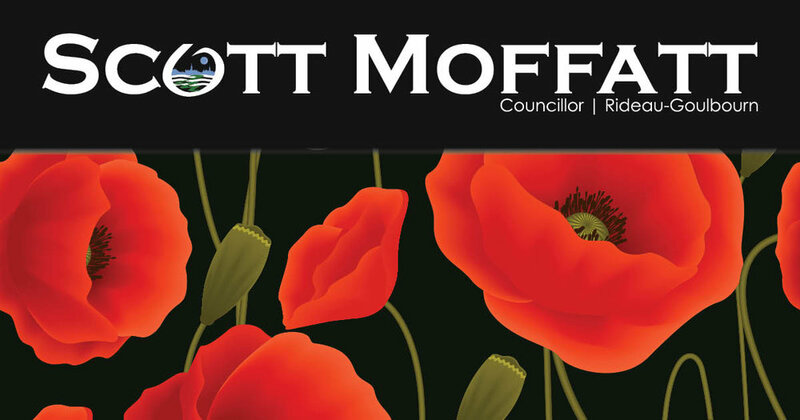 The Scott Moffatt Golf 4 Youth Classic is back! The tournament will be on Friday, July 6th at the Canadian Golf and Country Club. Last year, this event raised over $20,000 for Youth of Manotick Association and the Richmond Youth Centre! We are currently in the process of obtaining sponsorships for the tournament. If you are interested or would like more details, please contact our office and we can connect you with the tournament organizers. Furthermore, if you are interested in participating, you can buy tickets at golf4youth.ca. The 7th Annual Zumba Multiple Sclerosis Fundraiser is taking place at the Alfred Taylor Recreation Centre in North Gower on Friday, April 27th. Admission is $10. All process go to the MS Society. Donations of $20 or more will receive a tax receipt. The event begins at 7:00pm but you are encouraged to arrive early to sign the waiver form. The evening will also feature a live auction and plenty of door prizes. The Boundary Road item is to approve the zoning for a Provincially approved waste management site. This site would include facilities for recovery and recycling of waste as well as a landfill area. The applicant, Taggart/Miller Group, received Provincial approval for the facility in June 2017 from then Environment Minister Glenn Murray. Following Provincial approval, the applicant then must seek the proper zoning approvals from the host municipality. The item for 6341 Perth Street is a recommendation to partially approve an Official Plan Amendment and Zoning By-Law Amendment that would allow the previously stalled Hyde Park Development, now known as Samara Square, to move forward. The original plan called for the entire property to be served by a private water system. Under the current proposal, the property would be split into multiple parcels serviced by the one water system. Since that is not permitted under City policy, the applicant was required to seek an Official Plan Amendment. Due to the unique nature of this property and its stage of development, staff are recommending approval. Future phases to the north are still to be sorted out, as is the property ownership for the existing Hyde Park homes. The Site Alteration By-Law is something that will have an impact across rural Ottawa. The intent of the by-law, aside from amalgamating several existing by-laws into one, is to prevent land manipulation such as tree clearing and soil stripping for the purposes of large scale development. This is something that could occur in and around the urban boundary so as to make land better suited for growth, rather than agricultural purposes. The by-law does include exemptions for agricultural uses and managed woodlots. However, some concerns still exist that the by-law is too open for interpretation and that property owners may not have a clear picture of what is and is not permitted. I expect a number of delegations on the matter at our meeting and a healthy discussion. ARAC will also consider a one-time contribution in support of Farm and Food Care and their Breakfast on the Farm event, scheduled for September 8th in North Gower. For more information about Farm and Food Care, please visit farmfoodcareon.org. For as long as there has been a green bin program at the City of Ottawa there have been residents asking the City to make it easier for them to use the green bin. While many of us have inventive ways to keep the mess to a minimum or use the Bag to Earth paper bags, there are many more who will not use the bin because of the mess. Among other things, that is why the City has been working on a revised contract with Orgaworld Canada. After several years of legal wrangling and being stuck in a lengthy arbitration process, staff have been able to have a good dialogue with Orgaworld and have come up with a solution; allowing residents to put their organic waste in plastic bags, which will be screened out at the Orgaworld plant. For those residents who want a green bin with less mess and odour, this will certainly help. This change, however, does come with a cost. Adding plastic bags and dog feces to the green bin program will cost 15 cents a month per household. The green bin program is paid for out of the property tax base and not the separate garbage fee on your tax bill. As a result, this will not increase your collection fee. The City will build the additional cost into the annual budget. While this change has been greeted with mixed reactions among residents, I see it as a positive step to increasing participation in the green bin program and ensuring that we can extend the life of our Trail Road landfill. Trail Road’s lifespan is currently set to expire in 2043. I am not interested to opening a new landfill and this change will help buy even more time. In the coming years, though, the City will need to get serious about our post-Trail Road plans. It has been three years since the Plasco saga ended and we cannot waste time in planning for the future. For anyone assessed on the Cranberry Creek Municipal Drain, we have scheduled the Court of Revision meeting for Monday, April 23rd at the Alfred Taylor Recreation Centre in North Gower. The meeting will begin at 7:00pm. With the Engineer’s Report approved at Council last week, this is the meeting to consider appeals to the assessments in Schedule A of the report. Anyone subject to an assessment should receive notice of this meeting. Notices were mailed out on March 29th. Clapp Lane, Kanata South Link, Flowing Creek and Hobbs Drain & More! In my last column, I provided an update on the Clapp Lane development at 1125 Clapp Lane. As many of you are likely aware, this is a property that was acquired by the City of Ottawa and subsequently sold for the development of a seniors independent living centre by the Manotick Mill Quarter Community Development Corporation. The builder is Reichmann Seniors Housing. RSH acquired the property from Joe Princiotta following the sale from the City. Further to the last update, you can expect to see activity on the site this week. The general contractor, Laurin, will be setting up their trailer as well as fencing and signage. Over the next two weeks, the contractor will carry out work to prepare the two houses for demolition. Both demolition and tree removal are scheduled to begin April 9th. There will be an Open House regarding this property on April 4 from 6:00 to 8:00 pm at the Manotick Place Retirement Community (1145 Bridge Street). Parking is available across the street in the Clapp Lane lot. This is an opportunity for the community to get an update on plans. Coffee/tea and cookies will be served. The City of Ottawa invites you to a Public Information Session to review information with respect to the Kanata South Link project that is planned to begin fall 2018 with completion in spring 2021. Design drawings will be on display for your review. Staff will also be on hand to provide information and receive comments. This session is scheduled for Tuesday, March 27th from 5:30pm to 8:00pm at the Kanata Recreation Complex. Plans for future adjacent work including the Preliminary Design of Hope Side Road and West Hunt Club Road will be available for viewing, as well as the Preliminary Design of the Wetland Compensation Plans required for this project. City staff and the project consultant will be on hand to discuss the project, construction impacts and to respond to questions. Accessibility is an important consideration for the City of Ottawa. If you require special accommodation, please contact Carolyn Newcombe. If you are not available to attend the meeting or would like additional information, please direct your comments to the City of Ottawa Senior Infrastructure Engineer, Carolyn Newcombe, at Carolyn.Newcombe@ottawa.ca or 613-580-2424, x28230. The Rideau Valley Conservation Authority (RVCA) has completed hazard mapping studies for Flowing Creek and Hobbs Drains, which are tributaries of the Jock River. Members of the public are invited to an upcoming open house to review regulations and hazard maps. These studies provide new mapping that show areas that are prone to natural hazards such as flooding and erosion and have natural environmental features such as wetlands. The mapping will be used by the City of Ottawa when updating their Official Plan and Zoning Schedules and in the review of development applications under the Planning Act. RVCA will also use the mapping to guide the review of development applications submitted under the RVCA’s Development, Interference with Wetlands and Alterations to Shorelines and Watercourses Regulation. Members of the public are encouraged to attend the open house and/or provide comments on the mapping. Conservation Authority staff welcome historical records of past flood events, news clippings, photographs and even anecdotal stories to help confirm the reasonableness of calculations and resulting hazard mapping. The open house is scheduled for Tuesday, April 10th from 4:30pm to 8:00pm at the Johnny Leroux Stittsville Community Arena Hall in Stittsville. For those unable to attend the open house, mapping can also be seen online at www.rvca.ca/flowing-creek-and-hobbs-drain-hazard-mapping-studies. To understand how mapping may affect your property or to provide comments, please contact an RVCA Resource Specialist at development@rvca.ca or complete an online property inquiry form at www.rvca.ca/regulations-planning/general-property-inquiries. The City of Ottawa is proud to present Doors Open Ottawa (DOO). On June 2nd and 3rd, more than 140 of the city’s historically, culturally, and functionally significant buildings will open their doors for free public viewing, including several right here in Rideau-Goulbourn. For more information, please contact heritagevolunteers@ottawa.ca. Do you know a Snow Angel who deserves recognition? A Snow Angel is a neighbour or friend who has volunteered to help you, or someone you know who needs some assistance by clearing snow or ice from their property. 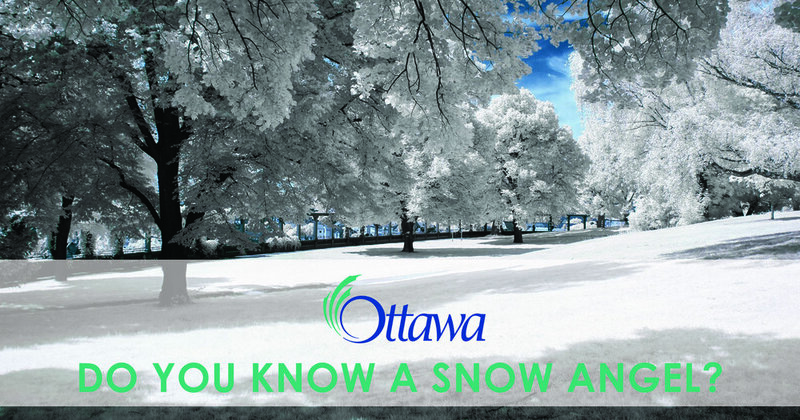 If you know of a resident of Ottawa who is a Snow Angel, the City of Ottawa wants to thank them! Snow Angels will be recognized with a certificate signed by Mayor Jim Watson and a custom keychain with a snowflake symbol and Ottawa logo. To nominate a Snow Angel, please provide the name and address of the candidate, as well as relevant details (who they are helping and how) by emailing communitypride@ottawa.ca or by regular mail Attention: Snow Angel Program, City of Ottawa, 100 Constellation Crescent, 5th floor, K2G 6J8.